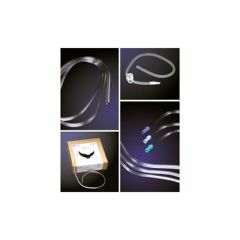 AllegroMedical.com presents The Nonconductive Sterile Tubing with Female Connectors 10' Long 3/16" I.D. 5mm. soft and pliable, this single use tubing resists kinking and coiling and has low memory. The versatile connectors provide a secure fit to a variety of sources and the ergonomic connector shape allows easy attachment and detachment.